Just regular folks. : Our new van. Edda's good appetite and growth has been a blessing, we have not had to struggle very much with one of the hallmarks of Rett Syndrome, poor growth. She is fast approaching 60 pounds this year and this is the first year that I've noticed that I'm really having trouble lifting her in the car, up the stairs and out of the bath. 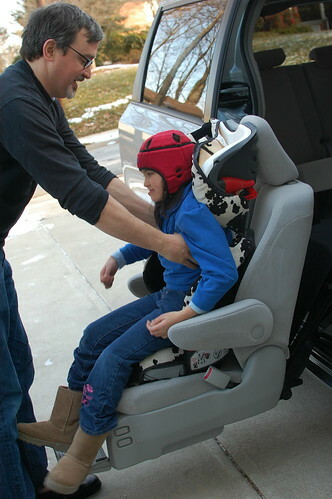 Finally, after years of thinking about it, we finally have a minivan in the family with a mobility seat installed. Awesome! and congrats of doing such a great job keeping her weight up!!! Van looks awesome...Did u get modified? or bought modified one? @Laura - he's totally into it, he likes to demo it to all our neighbors and pals. @Mom and Dad - we are waiting for you to come home soon! we miss you! @Nita - Toyota factory installed, this is the first year they have it as a "standard" option. We ordered it and 8 weeks later it was here! and @Dawn - last but not least, Edda's weight has (knock on wood) never been a big issue for us. She is a big girl who loves to eat! She is such a better eater than Vince who is on the "white" diet. Rice, pasta, bread and milk. I LOVE this Doris! Although Annie is light she's awkward because of her length and it makes it difficult to pull her in and out of the car, we have been looking at these chairs, can I ask if you bought the van or leased? Also, what kind of van is it? We are probably still a year or two out. @Bridget - we bought the van through Toyota, it's a Sienna. And we just ordered it through a Toyota dealership because now it's a factory option. It took about 8 weeks and the additional cost is about $5800 over the cost of the van, but you get $1000 back from Toyota for assistance..